Terrapin Brewing, Left Hand Brewing: Depth Charge, Ep. 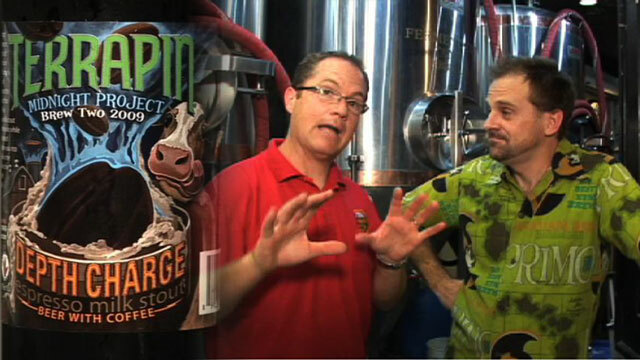 84 | Beer America TV - Craft Beer in Motion! Absolutely love the shirt John! Ah …. and this beer is amazing. I’m lucky to have a case of it in my cellar and am enjoying it immensely. Hey guys, we’d love to have y’all in Athens sometime. So, please do plan that trip you were talking about. As for the Depth Charge, glad you enjoyed it. It’s been one of my favorite beers Spike has brewed of late. Concerning the coffee, he actually uses a course grind of the beans, no brewed coffee. Spike adds 1lb per barrel of beer added after fermentation, steeps for about 2 days, and then immediately packages for that rich coffee flavor. Thanks for the clarification and added info Steve! Terrapin is one of my favorite breweries and I’m extremely sad that I can’t get it in Fort Worth where I live now. Dude…. John I love the Primo shirt!!! My Dad lived in Hawaii and all he drank was Primo, I really love your beer knowledge. I need to get out to Savanah, GA. Take Care.